VALIDATE® Body Fluids will make it easier for laboratories to support LDT validation, documentation of linearity, calibration verification and verification of the AMR for analytes in cerebrospinal, peritoneal ascites, pleural and pericardial body fluids, via our simulated body fluid matrix. LGC Maine Standards releases the only comprehensive body fluids kit on the market, VALIDATE® Body Fluids, Order Number 205ro, for easier linearity and calibration verification. The kit, in a simulated body fluid matrix, will assist in the documentation of linearity, calibration verification and verification of linear range for Albumin (ALB), Amylase (AMY), Cancer Antigen 19-9 (CA 19-9), Carcinoembryonic Antigen (CEA), Cholesterol (CHOL), Creatinine (CREA), Glucose (GLU), Lactate (LAC), Lactate dehydrogenase (LD), Total protein (TP), Triglycerides (TRIG), and Urea Nitrogen (UN). Each VALIDATE® Body Fluids kit, liquid and ready- to-use, prepared using the CLSI EP06-A “equal delta” sample preparation, offers five distinct concentrations to establish the reportable range. Simply dispense the solution from each dropper bottle, directly into five sample cups, and run in replicates. 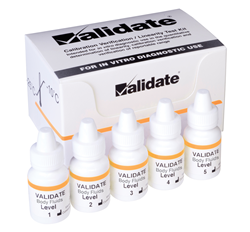 Release of VALIDATE® Body Fluids allows clinical laboratories to complete their required Body Fluids linearity and calibration verification, validation of in-house methods or laboratory developed tests (LDT) for analytes in body fluids – maximizing the reportable range while minimizing manual dilutions. Use of this product, while augmenting daily QC, assists with fulfilling various quality control requirements – such as Analytical Measurement Range (AMR) and Clinically Reportable Range (CRR) – for linearity and calibration verification under CLIA ‘88, CAP, COLA, JCAHO, JCI and ISO 15189. The addition of VALIDATE® Body Fluids to the LGC Maine Standards expanding portfolio of products demonstrates a continued commitment to manufacture high-quality linearity and calibration verification products that meet industry needs. LGC Maine Standards is located in Cumberland Foreside, Maine and manufactures VALIDATE® linearity and calibration verification kits for over 130 analytes, including General Chemistries, Urine Chemistries, Enzymes, Lipids, HbA1c, Therapeutic Drugs, Cardiac Markers, Thyroids, Serum Proteins, Vitamin D, Tumor Markers, Anemia, Fertility, Hemostasis, Whole Blood Glucose, and Body Fluids. With a history dating back to 1842, LGC has been home to the UK Government Chemist for more than 100 years and is the UK National Measurement Laboratory and Designated Institute for chemical and bio measurement. LGC was privatized in 1996 and is now owned by funds affiliated with KKR. For more information, please visit http://www.lgcgroup.com.